Sorry about not blogging for a few days, I was catching up on some much needed rest and time with the family. The final table was just a surreal experience. I arrived at Rio about a quarter to 3 with the final table scheduled to start at 3. As soon as I walk in the door there's a camera guy following me and filming me walk from the entrance to the Amazon Room. It was a really awkward experience for me, I didn't really know whether I was supposed to just act normal or do something silly. I'm not really one to ham it up for the camera, in fact I'd be much happier if the cameras weren't there at all. So then I get near the Amazon Room and they whisk me off to do some photoshoots and some promo stuff for the ESPN broadcast that will air in a couple months. So I'm doing that stuff for like 15 minutes and then someone comes in and says the final table is about to start and that we need to get in there asap, and I get there and they're already almost done with the player introductions. I'm glad though because by this point I'm just ready to play. The official final table is an 8 handed table, but we still had 9 people left since we had played until 5:30am the night before without being able to eliminate the last player. So while we're 9 handed we're still playing the mix games, and I run pretty good and chip up to nearly 3 million chips before someone was eliminated. Then as soon as we get down to 8 handed we take a half hour or so break and now we are playing no limit holdem for the rest of the final table. I would have preferred to play the mix games because I definitely felt like I had a bigger edge over the remaining field in some of the other non-nlhe games, but it is what it is and I still liked my spot playing nlhe. Unfortunately pretty much nothing went right for me once we started playing exclusively nlhe. I don't think I ever won a pot that had more than a few chips in it. Every time I raised it seemed like someone picked up a big hand and 3-bet me, and I don't really feel like I was getting picked on or anything because quite a few of the hands ended up being shown and were all strong hands. So by the time we get down to 6 handed I'm last in chips with like 2 million, and then I pretty much blinded down to about 1.2 million when I finally pick up a big hand with AKo. Matt Glantz opens utg for 150k at 30k/60k and I'm in the cutoff and obviously I shove, and it folds back to Matt and he tanks for like 3 minutes. Obviously I would have liked him to call here as I'm pretty sure I had him dominated but he eventually folds. So maybe like 5-10 hands later I get QTdd utg and raise to 125k having started the hand with about 1.4 million. Minh Ly calls on the button and everyone else folds. Flop comes AsQs6h and I check to Minh because I'm pretty sure he'll bet pretty much always here and I feel like I can get the most value from my hand by letting him take control of the pot. I have no plans of folding at any point in this hand because I know I'm crushing his range here and he likes to keep firing when he senses weakness. So anyway I check and he fires 150k and I think for a bit and call. Turn comes ten of spades putting 3 spades out there and making me 2 pair. I check again and he fires 380k, and I still feel like he can have tons of weak hands in his range where he's trying to push me off a marginal hand, and also some hands with decent equity where he hopes he can get me to fold, like something like KsTx, so anyway I shove at this point for like 1.1 million total because I'm more than happy to just take this pot at this point with the way the board looks. I considered just calling and checking any river to him again but I'm happy with how I played it. Unfortunately for me he instantly called and obviously I knew I was in terrible shape and he turned over 87ss for the flush. River came the 3c and I was eliminated in 6th place for 300k. Considering where I was on day 4, down to 17k chips at 40k/80k limit with like 13 people left, I definitely can't complain at all about finishing 6th, but obviously going into the final table I did have much higher hopes. Then as soon as I bust all I want to do is find my wife and get paid out and leave. But then they ask me to do an interview. I said no at first but they kind of pressured me into it so I did it. I think it was a little awkward because they asked me about my bustout hand and I'm really bad at explaining my thought process in an interview situation, my mind just wanders all over the place and I end up not making much sense. So that lasts for a couple minutes and now I think I can just go get paid and leave, but then another girl grabs me and says they need to do more promo/interview stuff with me. At this point I'm just getting annoyed but I don't want to come off like a complete jerk so I just say to make it quick. Unfortunately we have different definitions of 'quick' and all this stuff ends up taking like a half hour. I actually didn't mind doing this stuff as much as the previous stuff though. This was stuff like saying "5 DAYS" "8 GAMES" "THIS IS THE POKER PLAYER'S CHAMPIONSHIP" and was actually kind of fun to do. Then they took me into another room where I was asked to do some strategy interview for a new segment they're going to do on ESPN. Basically stuff like asking me what advantage do live pros have over online pros and vice versa, and what I thought of my fellow final tablers. This part was a little annoying for me because they wanted me to incorporate the question into my answer and I kept forgetting to do it and had to repeat my answers, but I think I came up with some good answers. So finally I get to payouts and that part goes quickly at least and then I have a nice dinner with my wife, which was the first time we've had a nice dinner alone the whole series. I was just glad we were able to find a babysitter to take care of the baby and she was able to come out to my final table, since we weren't able to for my o8 final table. Been an interesting series so far, I feel like I've been both really lucky and yet somewhat unlucky at the same time. Lucky in that both of my cashes are really nice cashes and in both of them I was the short stack with around 15 people left and ended up finishing 2nd and 6th, so I definitely got my share of rungood in those crucial spots. Without that I'd just have 2 mincashes. On the other hand I've had nice stacks in a few other tourneys this year and definitely could have cashed in about 5 other tourneys if not for unfortunate events close to the bubble. But obviously overall I could never complain about having nearly $600k in cashes in a series, considering my best series previously was probably around $60k in cashes. I play the main event tomorrow. I'm definitely glad I chose to play day 1d because I needed a few days off after playing every day for 5 weeks straight. I feel really refreshed right now and am ready to do some good things in the main event. Obviously I need tons of rungood for the main but anything can happen. You guys get the quick quick version because I'm sure most of you were following me anyway, but basically I started the day off good and got above 2 mil which was close to the chipleaders, then as the bubble approached I lost a lot of hands and was down to 500k, then the bubble burst and I lost more hands and I folded a triple draw hand with probably like 500k in the pot on the end with only 17k behind. So whatever I think I'm probably done. Then I quadruple up and triple up on the next 2 hands to get to over 200k and stuck around 200-500k for the next few hours, basically winning every time I was all in and losing any time I wasn't. I had a few ridiculous suckouts to stay alive, hitting a 2 outer and a 3 outer in separate pots, then went on a massive heater at the end of the day and ended with 2,315,000 chips and am currently in 4th out of 9 people left. I hope this is all coherent because it's like 6:30 am and I just got done playing for like 15 hours. 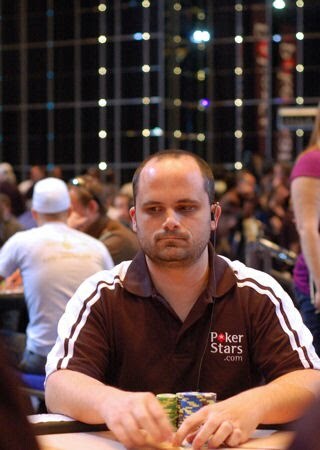 Anyone interested in hand histories just go to pokernews , I need to get a little sleep, we restart at 3pm. I'm pretty sure it will be shown on espn2 with a half hour delay, but don't quote me on that. I will tweet and let you all know where you can watch it though. EDIT: I believe it's on espn3.com not espn2. Entered the day with about 400k chips and ran kind of bad the first couple levels and was down as low as like 150k at one point, then I went on an absolutely enormous heater mostly in the stud games for the last 3 levels of the day and ended with 1,304,000 chips. I'm currently 3rd in chips with 29 people left, paying 16 spots. I feel like I'm playing absolutely great the last couple days, there was only one pot where I think I messed up today. It was a triple draw pot where I had a decent feeling the guy was trying to snow but I let the 3rd guy stay in the pot and he ended up outdrawing me. Another big pot I tried bluffing a stud pot with an ace doorcard where I checkraised 5th street against a guy with a 257 rainbow board and then bet the rest of the way, but he called me down with pocket QQs. I'm fine with that play though as I definitely think it works often enough in that spot to be profitable, and he definitely had a much stronger hand than he usually would have there. It feels great to be in such a great position in this tourney considering I ran pretty bad all of day 1, then doubled up on a nlhe hand on day 2 to get back to the starting stack, then ran bad again for 2 more levels. I'm really happy that I was able to weather the storm without getting impatient or straying from my gameplan for this tourney. Also nice to play in such a well-structured tournament where you can run bad for over a day and still have a chance to win. Started the day with about 80k which was about half the average stack, but the 3rd hand I pick up JJ in middle position at 500/1k blinds in NLHE. Erik Seidel limps, I raise to 4k, everyone folds to Erik who calls. Flop AJ2 rainbow, check to me, I bet like 5500, Erik checkraises to like 13k, I call. Turn is a 5, Erik bets like 19k I call. River is a 4, Erik bets 30k, I go all in for like 15k more and Erik tanks for a few minutes but finally calls and my hand is good. Pretty crucial getting a double up on the 3rd hand of the day. After that I hovered between like 120-160k for the next few levels, then went on a mini-rush in the 2nd to last level to get over 200k for the first time in the tourney. Then the last level I got down to like 150k with a half hour left in the day, then went on an enormous rush in the limit games, scooping like 8 pots out of the last 20 hands dealt, and ended the day with 398,500, which is probably around 10th in chips with 74 people left going into day 3. Event 55, $50k 8-game: Had a really tough table all day with Bill Chen, Robert Williamson, Daniel Negreanu, me, David Bach, Joe Cassidy, Barry Greenstein, and Brett Richey, in that order. Obviously there aren't many easy tables in this tournament but there are definitely better ones than that. I pretty much went on a slow downward slide all day in the limit games, but picked up a few big nlhe pots to stay afloat, which is pretty much the opposite of what my plan was. I think my biggest strength is the limit games in this format, but sometimes that's just the way the cards work. The last level I was really unhappy with how I played a stud8 hand where I definitely could have bluff raised the river and won the pot. My board was Th4h6hKc and I had split tens from the start, and his was 7c9c9s6s, and he value bet 2 pair into me on the river in a spot where he's usually just betting a low, since I had bet every street previously, but if he reraises my raise he almost always has a low and in that case it's hard for him to have 10s beat, so if I raise the river obviously it's a really tough call for him to make with just 2 pair. It's a play I know to make but for some reason just didn't think he'd be betting 2 pair very often there. Also another triple draw hand where I was upset at myself for now snowing in a pretty obvious spot. Funny thing is I probably would have lost the pot anyway but still annoyed that I didn't make the correct play. I ended the day with 80,800 which is about half of average stack. The good news is we still have plenty of play left as the next level is only 2k/4k for the limit games and 500/1k for the big bet games. "I did nothing. I did absolutely nothing, and it was everything that I thought it could be." 50k Player's Championship at 5pm tomorrow.